Even if you’re unfamiliar with emotional intelligence, at some point in your life you probably will have taken an intelligence quotient (IQ) test. An IQ test measures a person’s cognitive ability compared to the population at large. The average IQ is approximately 100. People with higher IQs tend to do better academically than those with lower IQs. From this knowledge, it would seem sensible to suggest that people with higher IQs will be more successful both in the workplace and in life. This makes a lot of sense. We’ve all met or worked with someone who is very clever but isn’t great at relating to people, and vice versa. Emotional intelligence or EI is the ability to recognize your emotions, process and understand them, and observe how they affect those around you. Having a high emotional intelligence means you not only understand your own emotions, but you also understand other people’s emotions. You understand other people’s emotions not just individually but also within groups. There is no link between IQ and EI. Whereas IQ doesn’t change much over time, it is possible to improve your EI. Before you embark on a conscious effort to improve your EI it is worthwhile taking an EI test to determine your starting point. There are many free EI tests available online. Unlike an IQ test, it is quite easy to cheat in an EI test, so it is important to answer all questions as honestly as you can. 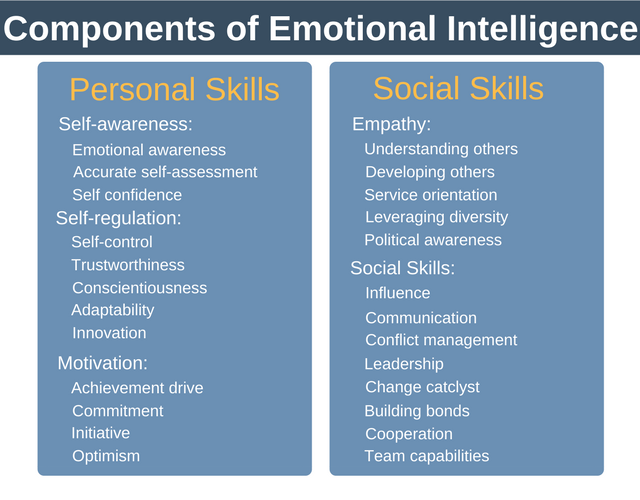 In his book, Emotional Intelligence – Why It Can Matter More Than IQ, Daniel Goleman developed a framework for understanding EI, consisting of five components split between personal skills and social skills. Let’s examine each of the five components within the framework in more detail so we obtain a basic understanding of all the components that make up emotional intelligence. Emotional Awareness: being able to recognize our own emotions and the impact they have on how we behave. Accurate Self-Assessment: being reflective enough to have awareness of our relative strengths and weaknesses. Self-Confidence: having belief in our own abilities. This confidence means we are not scared to take a contrary view if we believe it is the right thing to do. Self-Control: our ability to manage our negative or disruptive emotions and stay positive and in control. Trustworthiness: we are relied upon as being honest and truthful. Conscientiousness: refers to taking accountability for our own actions and workplace performance, and not blaming others for any shortcomings. Adaptability: makes us adept at handling change, and gives us the ability to manage the different and often conflicting demands on our time. Inventiveness: our ability to both seek out and create new ideas. Achievement Drive: a measure of our desire to deliver and meet results, and our desire to want to do succeed. Commitment: our commitment to meet the goal both for ourselves and our team. Being prepared to make a personal sacrifice to ultimately meet our goal. Initiative: our get-up-and-go and our ability to hustle to get things done. Optimism: our ability to remain positive and continue pursuing our goals despite the obstacles that arise. This gives us the ability to bounce back from setbacks. Understanding Others: our ability to get under the skin and understand how another person sees and experiences a situation. 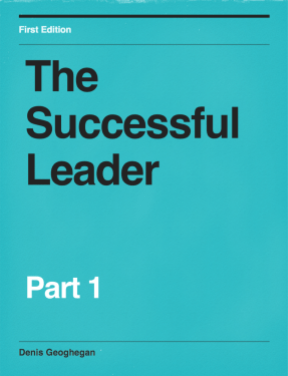 Developing Others: our ability to understand the strengths and weaknesses of others, and then create a plan to help them develop their weaker areas. Service Orientation: refers to our capacity to anticipate and then meet customers needs. Leveraging Diversity: how strongly we see diversity as a positive, and even create opportunity through it. Political Awareness: understanding the power networks that exist within groups and knowing how to work within these structures. Influence: our ability to persuade and build consensus amongst co-workers. Communication: the ability to clearly communicate with others through the most appropriate channel. Conflict Management: the ability to manage and resolve disagreements. Leadership: our ability to get others motivated by our vision and want to achieve it. Change Catalyst: our ability to recognize quickly that change is needed, and then our capacity to initiate and manage that change. Building Bonds: our capacity to build and then maintain mutually beneficial connections to others. This can be thought of as the sum of our personal and professional networks combined. Cooperation: our ability to work with others as part of a team to achieve a shared goal. Team Capabilities: our competence in building a team spirit and to bringing often diverse team members together. Improving your emotional intelligence isn’t something that happens overnight. In fact, it’s a process that lasts a lifetime. No two people are the same, and so what works for one person to improve their EI will not be appropriate for another. You’ll need to tailor your EI learning to your own personal situation and needs. If you have a coach or mentor it’s a good idea to work out with them what components of your emotional intelligence should be improved, along with how to go about improving them. Below you’ll find specific strategies you can investigate further to help improve each area of your emotional intelligence.